These Italian-inspired rolls are bursting with fresh spring ingredients, including baby fennel, mint, and lemon. In method, they are inspired by Vietnamese rice paper spring rolls, where fresh vegetables are wrapped in a sheet of rice paper and served raw. In this appetizer, prosciutto replaces the rice paper as the wrap, adding a salty savory component to the crisp vegetables and piquant Parmesan. Serve these rolls as a bright appetizer. You can prepare them up to 4 hours in advance – lightly brush the rolls with oil, then cover with plastic and refrigerate. Let stand at room temperature for about 15 minutes before serving. Place a slice of prosciutto on a work surface, short end closest to you. Lightly brush with olive oil. Sprinkle with a pinch of lemon zest and freshly ground black pepper. Arrange 4 to 6 arugula leaves horizontally at the base. Place a few slices of fennel and Parmesan shavings over the arugula. Top with a mint leaf. Roll up from the base, tucking the prosciutto tightly around the vegetables, and continue to roll, placing 1 or 2 additional arugula leaves in the fold as you roll up. Place seam side down on a platter. Repeat with remaining ingredients. I’m working hard to deal with my aversion to raw fennel – this should do the trick! 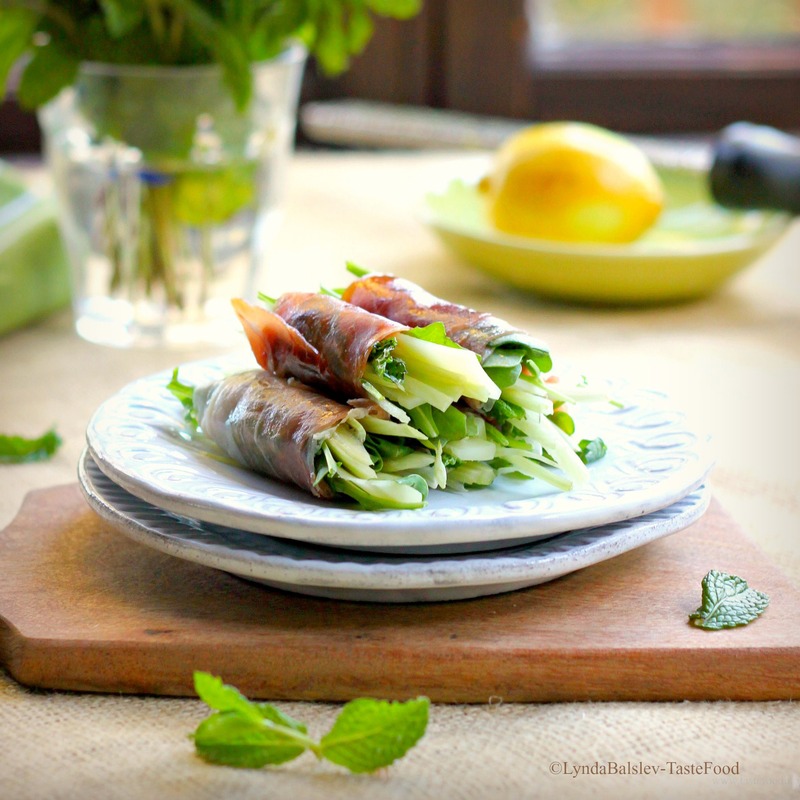 I love raw fennel and the prosciutto makes these rolls look delicious. Wow! What a fabulous appetizer for a spring fling! I’m thinking very lightly steamed asparagus would be another good choice for this great recipe.